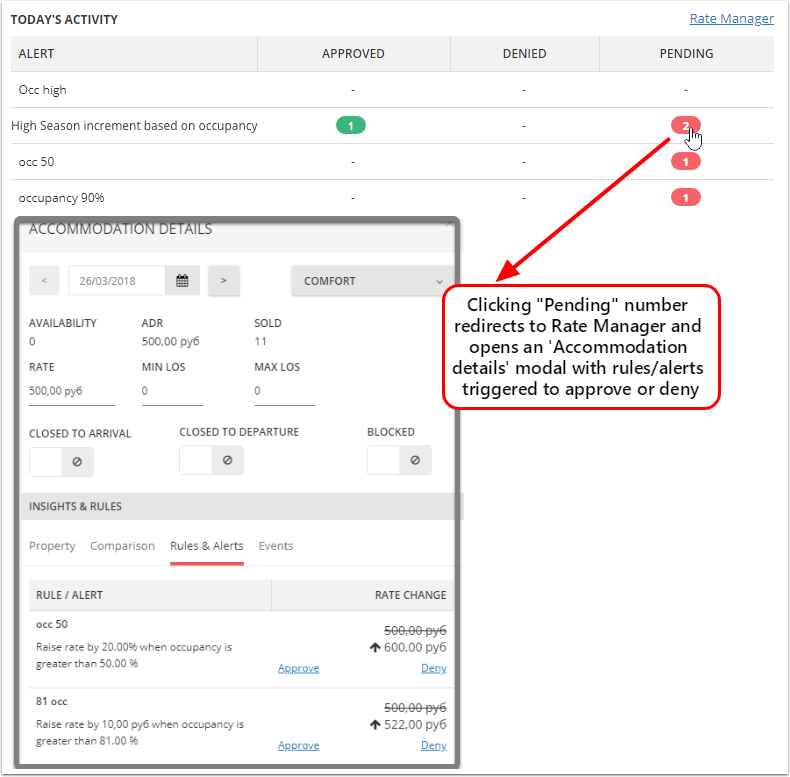 Overview page provides an at-a-glance review of your property's performance, helps you compare your rates to your competitors and displays rules/alerts triggered for today's date. For more detailed information check the sections below. This section of the Overview page shows your property's performance for the current business date. In order to check the performance of the property for yesterday, month-to-date and year-to-date - check the 'Performance' section below. Occupancy: shows today's occupancy for the entire property. RevPar (Revenue Per Available Room): shows today's RevPar for the entire property. Revenue Per Available Room (or bed) gives you the revenue booked (including additional room revenue) divided by every bed/room you have whether it was sold or not. Room Nights Sold: the number of room nights sold for today. Same as "Rooms occupied" number on your property's main Dashboard. ADR (Average Daily Rate): shows today's ADR for the entire property. Room revenue received over the last 30 days. If we have data for the same period of time last year, you will see a percentage change in the chart. This graph allows you to compare your rates with those of your competitors, starting from today and for the following 90 days (click arrows to scroll the graph). You may select the ranking to be displayed based on your lowest and your highest price (“my lowest price” being the default option). 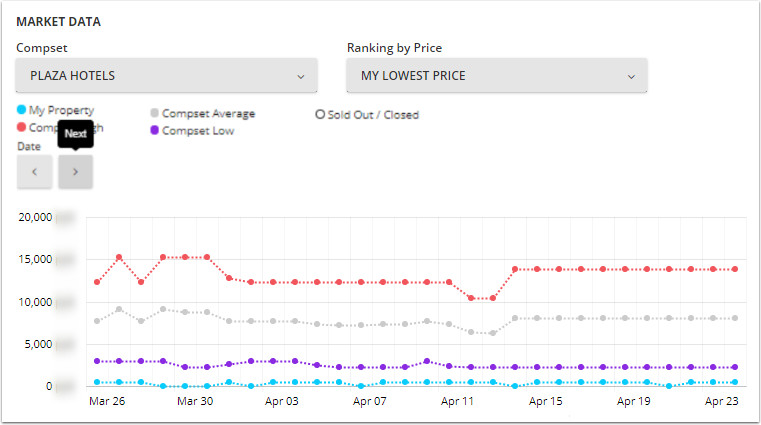 The following values are always displayed on the graph for the competitor's prices: lowest, highest and average. This section shows all the upcoming events created on 'Events' page. Occupancy: shows occupancy levels for the entire property. RevPar: shows revenue per available room for the entire property. ADR: shows average daily rate for the entire property. If we have data for the same period of time last year, you will see a percentage change as well. A list of all the rules triggered, approved and denied for the current day. 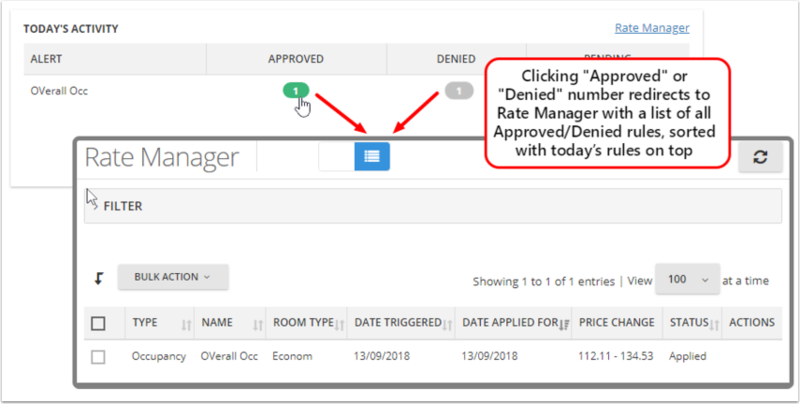 Clicking "Pending" number redirects to Rate Manager and opens modal window "Accommodation details" where you may approve or deny the rule or make additional changes to the pricing and stay restrictions for the corresponding date and accommodation type. AVGLOS is the average length of stay for a certain room type. ADR is the average daily rate for a certain room type. Shows the list of 5 top producing sources, with number of Rooms Booked, along with your ADR (average daily rate) for the source. This is a month calendar view of all dates with occupancy higher than 80% highlighted red. 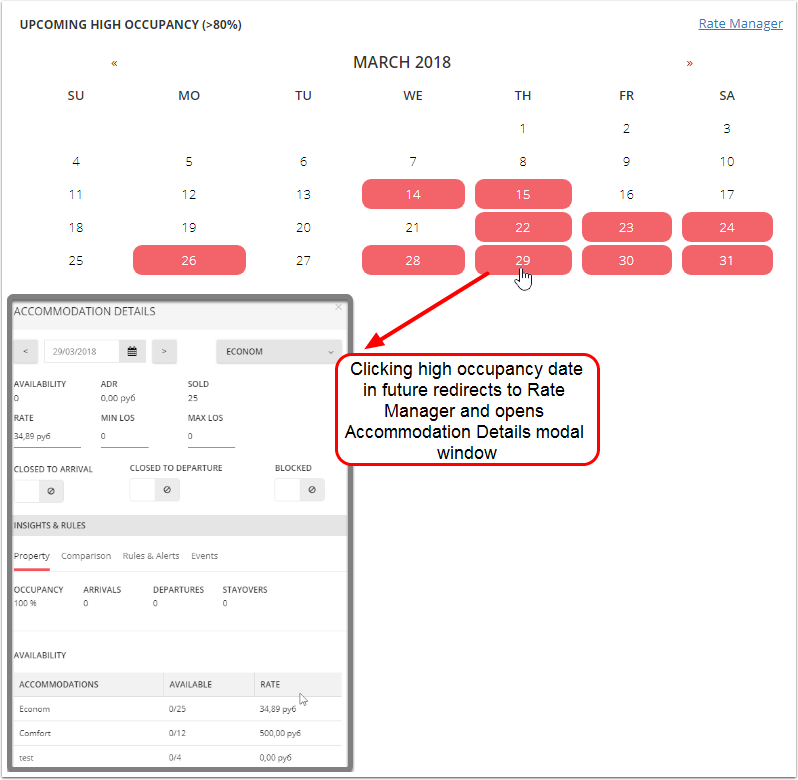 Clicking a high occupancy date that is in the future will redirect to the Rate Manager and open a modal window with 'Accommodation details' where you can make changes to the pricing and stay restrictions for the corresponding date and accommodation type. You can also click on 'Rate Manager' page at the top of this section to be instantly redirected to the Rate Manager page.